The FreeBSD operating system has become a popular OS choice for embedded systems due to its small size and the fact that it is free to users. However, detailed information on using FreeBSD is difficult to find. 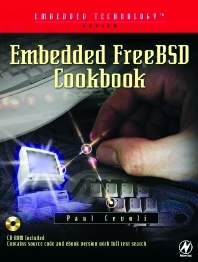 Author Paul Cevoli, an experienced embedded systems engineer, answers that need in this cookbook aimed at making life easier for engineers working with FreeBSD. Topics covered in the book include core operating system components, processes, process scheduling, virtual memory, device drivers and debugging, as these are the core features necessary for embedded system developers. Each chapter discusses basic components of FreeBSD, device drivers, Unix kernel, and C and GNU development tools, and provides the reader with the information needed to accomplish the stated task, along with sample source code. Paul Cevoli is an embedded systems engineer and programmer with over 15 years of experience with various embedded operating systems.